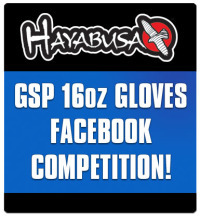 Don’t miss the chance to win yourself a pair of Hayabusa GSP 16oz Gloves with our Facebook Competition. All takes to enter is a click of a “Like” button and you’re in with a chance to win these amazing limited edition 16oz Gloves from Hayabusa. Check out the post on ourAi? ?Facebook PageAi? ?for more information! This entry was posted in News and tagged Facebook Competiton, Hayabusa, Hayabusa GSP 16oz Gloves, MMA on 14.06.2013 by .